The Spectra Symbol SoftPot potentiometer is a linear soft membrane potentiometer used for tracking position and acquiring the preferred output in a variety of applications. It comes in lengths from 10mm to 2000mm and offers a low form factor of less than 0.5mm, making it the thinnest linear sensor available today. Optimizing your manufacturing processes with a soft membrane potentiometer can increase your chances of gaining higher productivity and return on investment. Spectra Symbol, a trusted name in the linear position sensor manufacturing industry, provides components that will help achieve your business goals. The Spectra Symbol SoftPot potentiometer is a soft membrane potentiometer that can be utilized across a wide range of applications to track position and acquire the preferred output. It’s available in lengths ranging from 10mm to 2000mm with a low form factor under 0.5mm, making the Spectra Symbol SoftPot the thinnest and lightest linear sensor available today. It is also economical and easy to use. You can simply mount it on a surface and activate it using a spring-loaded wiper. The SoftPot is ideal for medical environments that rarely gets close to 50°C but require a sealed sensor and a tight form-factor. Thin-SoftPot designs are attractive to disposable instrumentation for its high-quantity, low cost requirements. 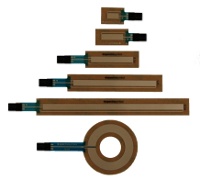 Contact us today to inquire about our linear position sensors and get a free quote. In simple terms, the SoftPot membrane potentiometer is a resistive element, which comprises a conductive resistor, a sealed encasement and a simple wiper assembly. A membrane potentiometer can also function as a voltage divider. By pressing a wiper down onto the top circuit the SoftPot produces the desired electrical output. The “wiper” is a non-conductive mechanism that depresses the top circuit actuating the potentiometer from the outside of the element. The top and bottom circuits are separated by 0.15mm (0.006″) of spacer adhesive build-up and contact between the circuit occurs by pressure (usually 1-3 Newtons) from the wiper on the top circuit, pushing down until the top circuit connects with the bottom circuit to create a potentiometric output. The construction of the wiper design can adapt to any application because most materials can serve as the wiper: plastics, metals, sliders, rollers, wheels, etc. Also, the SoftPot can also be manually (hand) actuated.